Independence Day – Are You Independent? Independence Day is the commemoration of the Declaration of Independence. On July 4, 1776 the Continental Congress signed the document and declared America independent from Great Britain during the Revolutionary War. I won’t get into a long historical discussion, but this is a good opportunity to talk about the subject of Independence and our perspective of independence in this country. At a job/company that you hate? Dependent on government assistance for your lively hood? Stuck in a negative life cycle? Living the life that the government, powers that be, the system, or whatever you want to call it has designated for you? Hmmm interesting questions huh? Sometimes we get so bogged down with life we do not take the time to stop and ask ourselves some important questions. Every few years we should take the time to re-evaluate our lives. I often joke that I am a new person every two years. Now that may be a little excessive! And that is not advice on the correct way to do things by the way! But my point is that all of us should re-evaluate our lives from time to time. Our desires, interest, and priorities change as we travel this journey of life. And if you are still living one way, but your heart is somewhere else, you may be divided. Now for the second part of our discussion, your perspective of independence in this country. We already discussed that as African Americans we have a tragic story. But I want to talk about our perspective. How do we look at ourselves, and our country? I personally find strength, dignity, and motivation in our history. As horrible as our story is, think about the strength that it took to survive slavery and all of the atrocities that came with it. Like it or not, this is where we are, so we might as well make the best of it. I also believe that everything happens for a reason, and slavery was no surprise to God. He knew what was going to happen before, during and after Africans were forced into slavery in America. He knew that I would be born in Detroit, MI on May, 13th 1976, so it must’ve been meant to be. So now, what am I going to do with it? Two of my favorite historical figures are Harriet Tubman and Dr. Martin Luther King Jr. Harriet Tubman escaped slavery and then traveled back multiple times to help free others, she was One…Though…Woman!!! Dr. King gave his life in the fight for Civil Rights for ALL in this country. If Harriet or Dr. King were raised from the dead today and saw the state of YOUR life, what would they think? Would they be proud? Would they feel it was worth the fight? 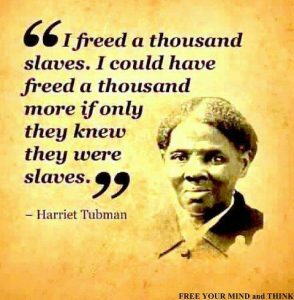 HARRIET FREED HER OWN SELF FROM SLAVERY. Dr. King gave his life for us to gain civil rights and liberties. Even in the thick of slavery and segregation, they sought independence. They were focused on the opportunity for freedom and independence and they were GOING to get it! Are you? As many issues as we have in this country, it is still the land of opportunity. Millions have come here looking for “independence” and “opportunities” for a better life. Even with our history, I am thankful to be an American. As I stated above, God knew I would be born here, so it must have been meant to be. I am not a mistake, the time period I was born into was not a mistake, and where I was born was not a mistake. I can’t change the past, so I might as well do the best that I can with what I have been given. What about you? Are you independent? What is your perspective of independence in this country? I don’t have all of the answers about this subject, and I am not pretending to. I aim to stimulate thought and conversation. If we don’t talk about it, we can’t find solutions. Happy Independence Day! Both for our country…and for you! Why it’s so crazy cause I was thinking about that yesterday. 🤔 I’m Free Now What?? ?